All School Winter Art Show is Open! 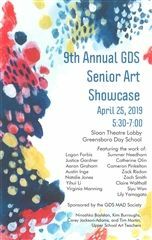 The Greensboro Day School Visual Arts Department and the MAD Society are pleased to present the 2018 All-School Winter Art Show, featuring 2D and 3D artwork by Bitty Bengals through 12th grade. Please drop by the McMillion Media Center during the month of December to support our amazing student artists. The exhibit will also be open one hour before the Winter Band Concert on December 6 and the Winter Strings Concert on December 11, with holiday treats for all!